This imposing brick building was erected in 1904–05 to replace an earlier wooden structure destroyed by fire New Year's morning of 1904. 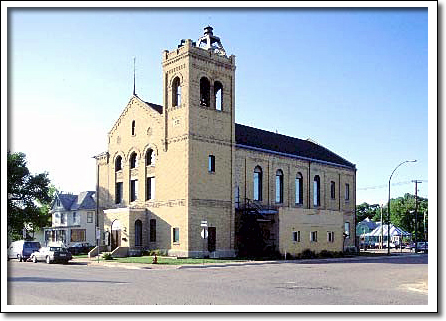 Designed by Stuart Geekie, a Dauphin architect and local politician, this Romanesque Revival-style building accommodated a variety of services—town hall offices, courthouse and jail, fire hall and an auditorium. In 1956 the building became the headquarters for the Dauphin RCMP and the Fire Department. This building has been the home of the Dauphin Allied Arts Centre Inc., since 1973. On June 9, 1985 the Centre was officially renamed the Dr. Vernon Watson Arts Centre in memory of the guiding spirit behind the formation of the Dauphin Allied Arts Council.